Despite everything that's been going on here I managed to make a couple of cards. One of them is the one I am about to show you... I made it for the new challenge that just started at Magnolia-licious challenge blog. The theme is Anything goes with optional spring. 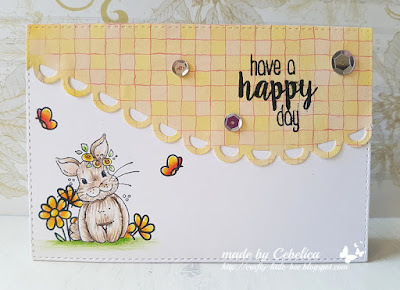 I made a CAS card with the super duper cute bunny stamp from Magnolia's Sunbeam collection. I made an attempt to create a spring scene with some flower and butterflies stamps. I did the colouring with pencils. To decorate the card I only used a couple of sequins. I hope you will come play with us this month. An adorable Bunny Cebelica, perfect for our 'All about Pets' theme at Allsorts challenge this week, many thanks for joining in. Oh what a cute bunny and love the fabulous card you've made with him. That bunny is so darling, and makes for a lovely card. 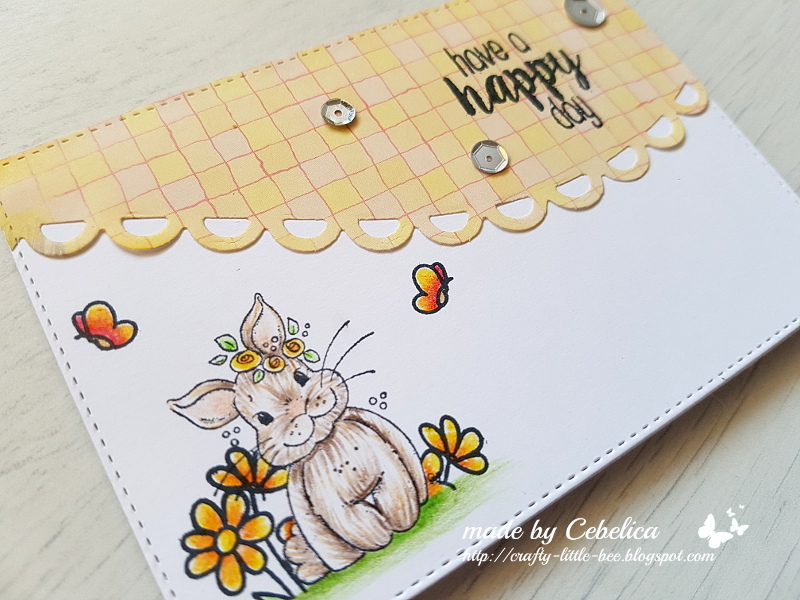 Lovely creation, such a cute bunny! Thank you for entering our challenge at Allsorts this week. Adorable! Thank you for joining the CAS-ual Fridays Challenge, April Showers Bring May Flowers. So sweet and cute. Love the cute butterflies around the little bunny. Thanks for playing along with us at the CAS-ual Fridays Challenge. Hello sweetie, gorgeous card!!! The little scene is super cute, loving your colouring too!!! I could not make a CAS card if my life depended on it he he!!! Have a lovely day and thank you for entering LHOSM too sweetie. Adorable card, Maya!!! Love the style of it and your rabbit is the cutest!